GO Team is onto something. They got to the core of Hitman, but I wasn’t sure how distilling down Tomb Raider would turn out. I figured it would be too slow or other turn-based issues would get in the way of it actually feeling like Tomb Raider. Before the end of the first stage it was clear that Lara Croft GO is the purest form of tomb raiding. 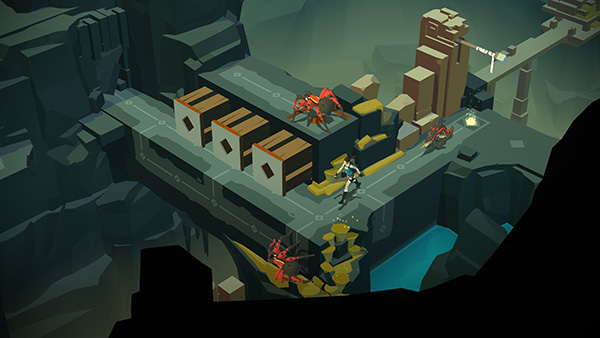 It also didn’t hurt anything that Lara Croft GO turned out to be a perfect compliment to the console release. Feels like Tomb Raider? That’s enough to get me in the door, but it’s the puzzle design and art style that makes the the Lara Croft GO experience so memorable. While it works great as a mobile game that you can pick up and play for any amount of time, I couldn’t stop myself. Each new puzzle mechanic is introduced smartly and then integrated into more complex levels without ever treating the player like an idiot. Naturally, this makes each level satisfying while at the same time whetting your appetite for the next puzzle. Thanks for letting me think I could keep up with the Tomb Raider, Lara Croft GO.